A photo of Dr. Lee V. Stiff receiving the NCTM Lifetime Achievement Award on Wednesday, April 3. 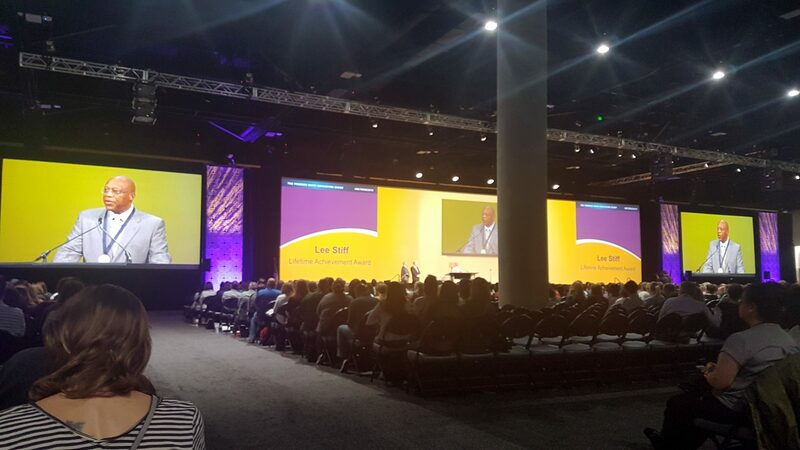 Lee V. Stiff ’78PHD, associate dean for faculty and academic affairs at the NC State College of Education, received the 2019 National Council of Teachers of Mathematics (NCTM) Lifetime Achievement Award at the opening session of the council’s annual conference held on Wednesday, April 3. The award honors NCTM members who have exhibited a lifetime of achievement in mathematics education at the national level. The award is presented for achievement in leadership, teaching and service. NCTM takes the following into account when determining its recipients: performance on the job; service beyond the requirements of the job at the state and national level; and service to NCTM. Stiff holds a bachelor’s in mathematics from the University of North Carolina at Chapel Hill, a master’s in mathematics from Duke University, and a Ph.D. in mathematics education from the NC State College of Education. Since 1989, he has been a co-author of elementary, middle grades, and high school textbooks in mathematics, published by Houghton Mifflin Harcourt and Holt McDougal. From 2000 to 2002, he served as President of the National Council of Teachers of Mathematics. Stiff has received numerous awards and accolades throughout his career, including the Blackmon Award for Excellence in Teaching while on the faculty at the University of North Carolina at Charlotte, the Rankin Memorial Award for Excellence in Mathematics Education from the North Carolina Council of Teachers of Mathematics, and a Fulbright Scholar Award to the University of Ghana. He was named the College of Education’s Distinguished Alumnus in 2010 and received the Benjamin Banneker Lifetime Achievement Award in 2015 and the TODOS Iris M. Carl Leadership and Equity Award in 2017. His publications have appeared in the top-ranked journals in his field, and he is a much sought-after speaker on issues of equity and mathematics education.